Google has just announced a new feature that will become available on all Android 2.2 and above devices that is called “Verify Apps“. This new setting can be enabled or disabled and will drastically increase the security of your device. What does it do? Enabling this feature will make Google continuously scan for malware and suspicious activity, previously this feature would only scan apps as they were being installed but adding these new capabilities should improve your device’s overall security. How do i enable it? The feature can be enabled in the Settings tab > Security > Verify Apps. 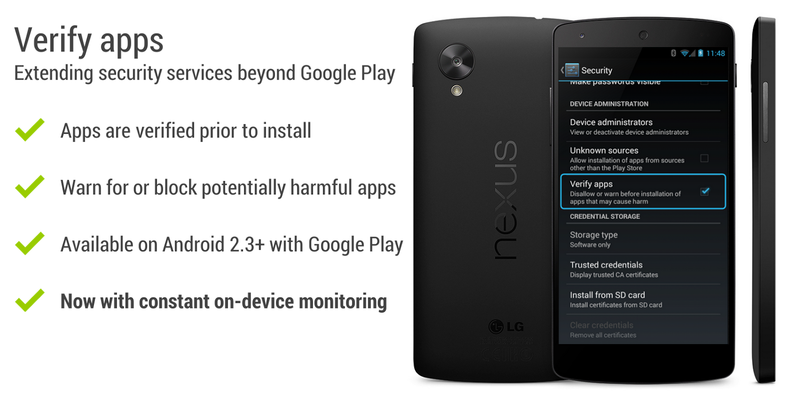 How do i know if my Android version supports it? If your device is running Android 2.2 or above it does support this new feature. If you have bought your Android device in the last 4 years it is very unlikely you are running an older version of Android then 2.2 as we currently are at version 4.4 called Android Kit Kat.